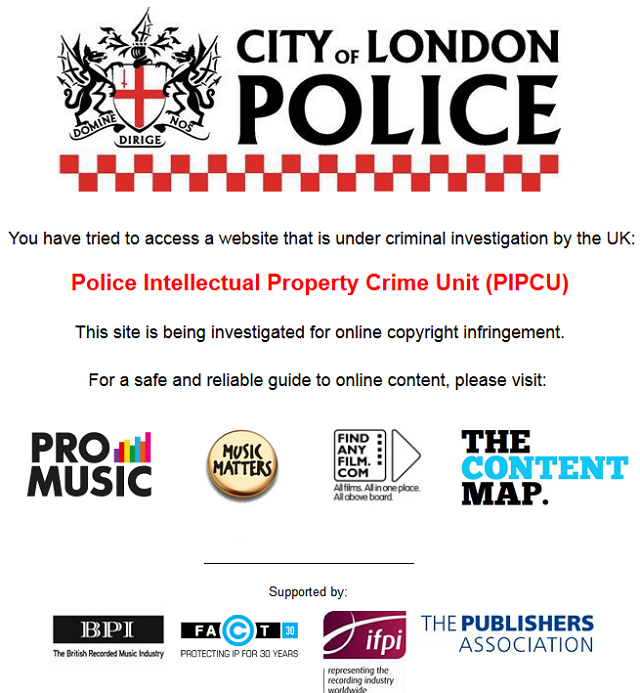 Continuing its attacks on file-sharing-related domains, the UK Police Intellectual Property Crime Unit has shut down its very first search engine. Following an earlier BPI request for it to be blocked by the country's ISPs, in the past few hours file-host search site FileCrop was shuttered as part of a PIPCU investigation. Following its launch in the last quarter of 2013, City of London Police’s Intellectual Property Crime Unit (PIPCU) has been working hard to disrupt the activities of sites in the file-sharing arena. The Unit works on the recommendations of international music, movie and TV companies but is financed by the UK taxpayer, funding set to continue if Prime Minister David Cameron’s IP advisor has his way. PIPCU’s activities began with the sending of warning emails to many domains around the world, warning them that non-compliance with police requests would result in further action. That action has taken several forms, including the attempted seizure of domains, reported disruption of advertising revenue, through to physical raids such as the one carried out on Boxing Guru earlier this year. Today there are clear signs of further action by PIPCU. During the past few hours, file-sharing site FileCrop disappeared from the Internet, to be replaced by the PIPCU notice shown below. While it’s not particularly unusual for PIPCU to target file-sharing related sites, what is special in this case is the nature of the FileCrop operation. FileCrop wasn’t a non-responsive Pirate Bay style torrent site, nor was it a file-hosting site operating on the boundaries of the law. 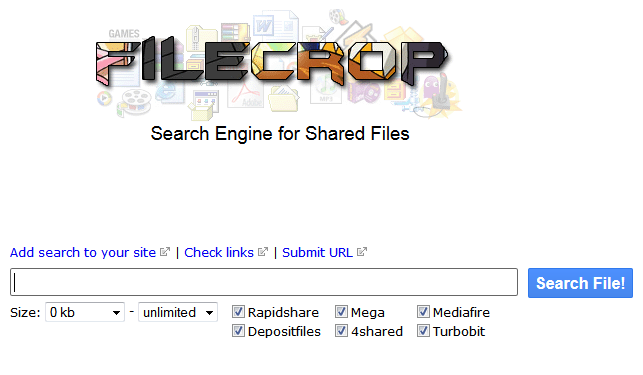 As illustrated by the image below, FileCrop was a search engine that allowed its users to seek content hosted on various file-lockers around the world including RapidShare, Mediafire and Mega, sites that all have strict notice-and-takedown procedures. While the police making a search engine a priority target seems somewhat unusual (FileCrop also responded to takedowns), the targeting of FileCrop doesn’t come as a complete surprise. In mid 2013 the BPI began preparations to have another batch of domains blocked by local ISPs. FileCrop.com was included in that list and before the year it was mostly inaccessible in the UK. The Alexa chart below suggests that the blockade had quite an effect on FileCrop’s popularity. While there has been no announcement from City of London Police, previous actions resulting in the displaying of the “under investigation” banner shown above have always followed boots-on-the-ground efforts by the authorities. This suggests a UK presence for FileCrop’s owners or operators, although examination of the site’s WHOIS entries suggests that the domain owner is located in Ukraine. Another unusual aspect to the case is why police would prioritize a site that apparently causes relatively few problems for rightsholders. While Google received more than 659,000 complaints last month against Fileshut.biz, a functionally similar site, the search engine has been receiving an average of just 37 complaints a week against FileCrop. TorrentFreak’s requests for information from the police have gone unanswered this morning, suggesting that it will be next week before more is known about this case. Update: The sports streaming site Cricfree.tv was shutdown as well. Update August 17: Cricfree got its domain name back.